You know how it is. You’re at a party, chatting merrily, and then someone brings up the em dash. You nod wisely, hoping no one will notice the terrified confusion in your eyes, and then quickly change the subject: “Speaking of Dash, what do you think of the new Incredibles movie?” Punctuation crisis averted—at least for now. We’ve all been there. But no longer! All your dash questions are about to be answered. For example, what is the use of a dash in English? What is the purpose of an em dash? What is an en dash used for? How exactly should we be using dashes? And what is the difference between a hyphen and a dash? How do I know if I’m using dashes correctly? To begin with, an en dash is so named because it is (or used to be in the days of typesetting) the width of an N. En dashes are mostly used to connect number ranges. 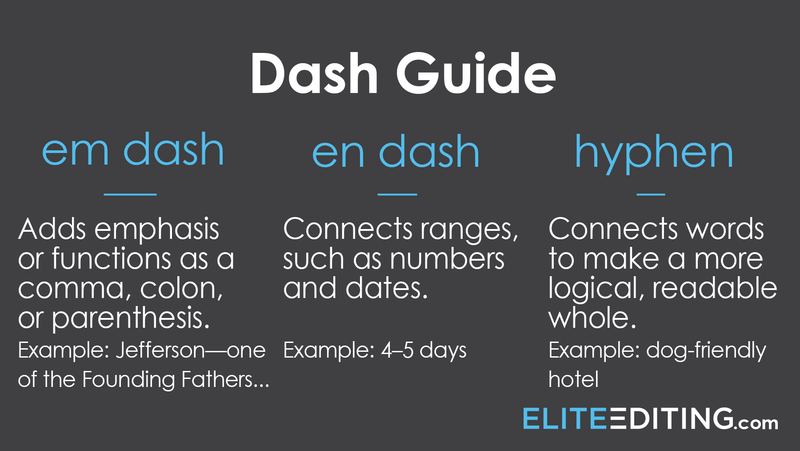 An em dash, logically, is the width of an M. Em dashes are typically used to set off information or add emphasis. What Is the Purpose of an Em Dash? An em dash is a versatile bit of punctuation that can function like a comma or colon or set of parentheses. The most common uses of em dashes are for bracketing parenthetical information and for adding emphasis. 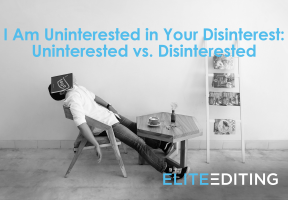 Using em dashes in this way can add real flair and energy to your writing—a dash (aha!) of drama, if you will. One of the best uses of em dashes is to set off parenthetical information that doesn’t quite fit logically (or sometimes even grammatically) into a sentence but that still enriches the topic. They work exactly as a set of parentheses would, but they add a bit of oomph to the information they enclose. If using parentheses is like whispering behind a cupped hand, using em dashes is like speaking in a clear voice with one eyebrow raised. When these extra helpings of information appear midsentence, em dashes should be used as a pair, one on either side of the insertion. When the added information comes at the end of the sentence, you only need one. When the neighborhood women—including my mother and my aunt Gracie—get together for coffee and cake, I’m always convinced they’re talking about me. The man known as the “Penman of the Revolution” was not Thomas Jefferson but rather John Dickinson—one of the least-famous Founding Fathers. Like a colon, an em dash can be used to expand upon an idea. It’s like an arrow pointing the way to the missing bit of information. The em dash can also be used to interpolate a comment midsentence or to signal an interruption. I don’t care what you think you overheard. I love only one person—you. Whether Shoeless Joe Jackson—“Say it ain’t so, Joe!”—was complicit in throwing the 1919 World Series is hotly debated. What Is an En Dash Used For? En dashes connect two elements that are at either end of a range—for example, temperatures, times, dates, or page numbers. As you might guess from that list, en dashes are most frequently used to connect numbers, but they are occasionally used with words as well. Between two numbers, an en dash means “from this to this.” Times, page ranges, Bible verses, years—en dashes work between all of these. The library will be open 10:00 a.m.–6:00 p.m. daily. For tomorrow’s class, I have to read pages 32–296, so I’d better get started. If you need more encouragement, James 1:2–4 speaks on perseverance. Another elegant use of the en dash is to connect a prefix to an open compound or to connect an open compound to another word to create a compound modifier (like a multiword adjective). In the pre–World War II years, Germany suffered from hyperinflation and thus growing poverty. Her New York–style studio apartment had great wood floors and no closets. What Is the Difference between a Hyphen and a Dash? The most noticeable difference between hyphens and any kind of dash is that hyphens are shorter. Hyphens typically connect words or parts of words into a more logical and readable whole. For example, if you wanted to have a party with your friends at a hotel that welcomed dogs, you could have a get-together at a dog-friendly hotel. For more about the many uses of hyphens, have a look at this post. Other than using the wrong type of dash, there are only a few common dash mistakes. 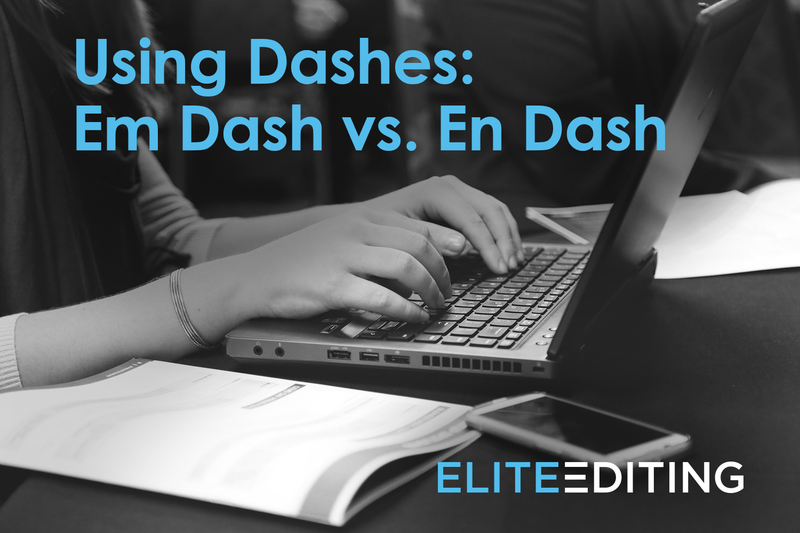 The most common en dash mistake is using dashes when you’ve already opened with a range-defining word like between or from—that is, a word that does the same job. You don’t need a belt and suspenders. Incorrect: The botanical garden is open from April–November. Correct: The botanical garden is open from April through November. Incorrect: In Crete, the springtime temperatures vary between 45–70 degrees. Correct: In Crete, the springtime temperatures vary between 45 and 70 degrees. Another relatively common error is to use an en dash to connect a prefix to an already hyphenated compound. While the en dash is great for connected prefixes or other words to open compounds, you don’t need it when the compound is already hyphenated. Incorrect: The space-age–style furniture looked like something the Jetsons might have owned. Correct: The space-age-style furniture looked like something the Jetsons might have owned. Probably the most common em dash mistake is leaving spaces on one or both sides. Most style guides recommend using em dashes without spaces—like this. Can you use dashes in formal writing? Can you use dashes in an essay? While it’s never a mistake to use an appropriately placed en dash, whether you can use em dashes in formal writing is debatable. It is a slightly informal punctuation mark, so it’s best to use it sparingly in formal writing. However—and never forget this—great writers (including Henry James, F. Scott Fitzgerald, Emily Dickinson, and Mark Twain) have been using em dashes for centuries to great effect. So can you use dashes in formal writing? Can you use dashes in an essay? The answer to both questions is yes—so long as you use them deliberately and sparingly. In fact, using dashes correctly can really show off your writing skills and knowledge of the finer points of English grammar. In a perfect world, all keyboards will have em dash and en dash keys, and life will be easy peasy. Until that day, however, the easiest way to insert either punctuation mark into your text is with keyboard shortcuts. Here are a few of the most straightforward approaches. If you have a Mac (with or without a number pad), use these shortcuts. In addition, most word-processing programs will automatically turn a double hyphen with no spaces on either side (–) into an em dash, and some will turn a double hyphen with spaces on either side ( — ) into an en dash. For other programs (like Google Docs), you can create your own shortcuts. For example, in Google Docs, you can make any shortcuts you like by going to Tools and then Preferences. 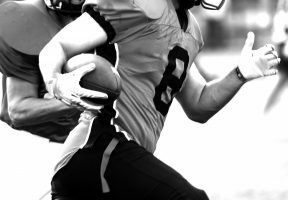 The em dash is already so darned versatile that it’s no wonder that when two or three of them get together, they serve even MORE useful functions. Here’s how to use a 2-em dash and a 3-em dash. A 2-em dash stands in for a missing word or a part of a word. You might use it if you’re transcribing something illegible or if you don’t want to fully identify a particular person. Mr. G—— was called to the stand but refused to testify. The message was so smudged that this was all I could make out: “If you d——, yo—— see H——. You might also find it useful to replace an expletive if your audience is delicate. A 3-em dash followed by a period is a useful shortcut in bibliographies and reference lists when there are multiple texts by the same author. Here is an example of how a 3-em dash would appear in a bibliography. Rowling, J. K. Harry Potter and the Sorcerer’s Stone. New York: Scholastic, 1998. ———. Harry Potter and the Chamber of Secrets. New York: Scholastic, 1999. 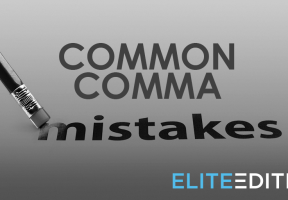 Join us for future articles on grammatical issues, or check out our list of common comma mistakes and how to correct them. And if you want to brush up on your writing skills, you’ll love this post.